Of all the festivals that are celebrated in the state of Kerala, it is Onam which is marked by the greatest of ostentation and ceremony. The ambience is colored with the same cheer that fills the peoples hearts. There is a very interesting story that is associated with the celebration of Onam in Kerala. Legend says that there was a very just and good king in Kerala. This king Mahabali was genuinely concerned about the welfare of his people. His subjects not only owed allegiance to him but also loved and respected him. This mutual relationship of love and harmony made the Gods in heaven jealous for King Mahabali belonged to the demon race. They were very desperate and urged Lord Vishnu to consider the matter. In the guise of a dwarf, Lord Vishnu went to the royal court of Mahabali begging for alms. When asked by the king, he said that he would like to have only that much as he could cover by his foot. The king was deceived because he thought that the steps of a dwarf would cover very little area. However Lord Vishnu covered the land and the sea with one step, his second step incorporated the heavens and his third the head of the king. 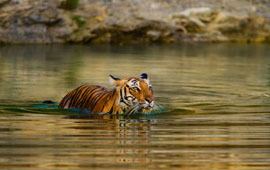 However the king was granted one wish which is that he could return to his beloved people once each year. Onam is celebrated to welcome this king who is fondly remembered to this day. There are several customs and traditions that are associated with the festival of Onam. The houses are cleaned and the courtyards are beautifully decorated with designs made of flowers (pookkalam). In the evenings, oil lamps illuminate the courtyards. Women are seen performing the Thiruvathirakali dance around the lamps. People wear new dresses. A grand lunch forms part of the festivities. The sweet dish Payasam is an important item in the menu. Many boat races are also organized when this festival is celebrated in Kerala. Each and every household in Kerala enthusiastically participate in the high spirited merriment. The ceremonial elegance and splendor of Onam is unmatched by any other Kerala festival. 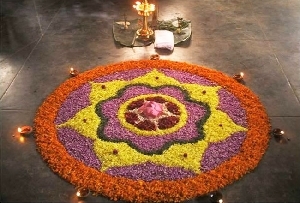 Onam is celebrated each year in the Malayalam Month of Chingam. This falls either at the end of the month of August or in the beginning of the month of September.